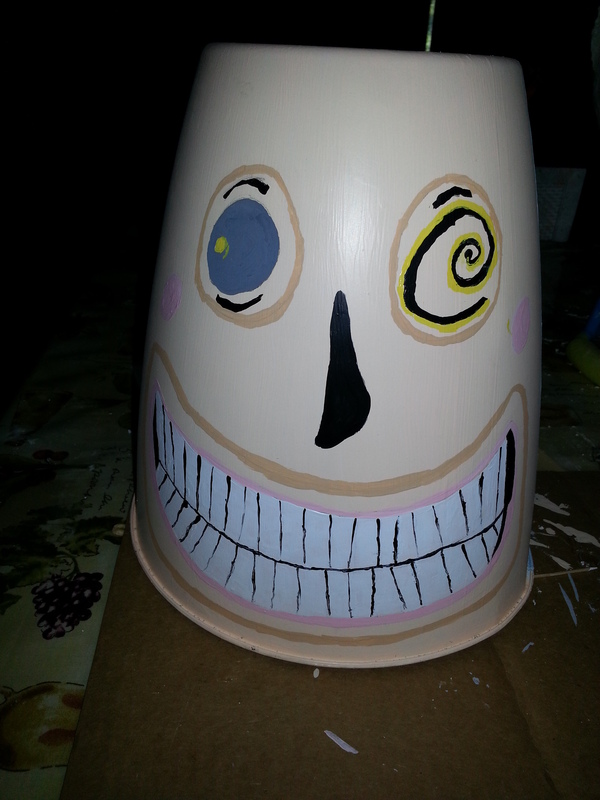 The head for the Mayor from The Nightmare Before Christmas is made from a garbage can squashed a little. Image courtesy of Debbie Morrow. All Rights Reserved. For those who are looking forward to the Mayor tutorial, you may have to wait a little longer than expected. I’ve already started the first of the series, which is probably the most daunting. This is not a task to take lightly. I must step into the shoes of a person who has no knowledge of PVC frame building. With over 40 cuts of PVC needed to make the frame along with finding the word usage for the assembly – it will take several days to add the steps in a clear, concise manner. I have reread and edited after taking a break, in order to help those who are really interested in building it. Will they have the directions in time for Halloween? Probably not. I’m sorry to disappoint those who were waiting. Yet, it is more important to give accurate and clear directions rather than posting pics without guidance. This entry was posted in Props and tagged Halloween, Mayor, Technical Writing, Tutorial by thewritegirlforthejob. Bookmark the permalink.